NBA-ESPN billion-dollar deal: When is the TV-sports bubble going to burst? What does the $24 billion NBA deal mean for the future of TV sports? 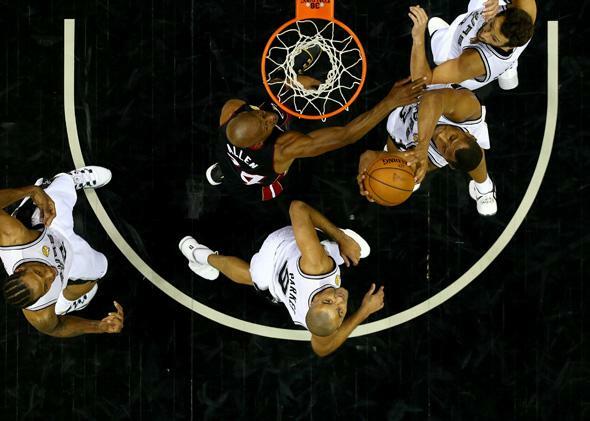 Boris Diaw of the San Antonio Spurs goes to the basket against Ray Allen of the Miami Heat during game five of the 2014 NBA Finals at the AT&T Center on June 15, 2014, in San Antonio. The game was aired on TV. The problem with inexorably rising costs is that you need somebody to pay for them, and it’s not clear how much longer the typical family can afford the luxury of pay-TV. This, however, misses a few steps. After all, it’s not “the typical family” who’s paying all those billions of dollars—it’s ESPN and Turner and other cable channels. In turn, those channels recoup their costs in part through advertising and in part by charging cable companies such as Time Warner and Comcast for the rights to carry their programming. And then, eventually, the cable companies try to cover their costs by raising the price of cable TV. Certainly the rising price of cable TV, along with the fact that the Internet now provides a decent alternative, is causing a steady reduction in the number of cable TV subscribers. The Wall Street Journal has this chart. But the fact that the blue line is going down rather than up isn’t really the problem. If the number of subscribers has decreased by 10 percent in five years, but the amount each subscriber pays has increased much more than that, then the cable TV companies are still happily looking at steadily rising revenues. A back-of-the-envelope calculation shows we’re still quite a long way from the point at which consumers are bled dry. ESPN is the most expensive channel to carry, for a cable TV company, at roughly $6 per subscriber per month. If their total outlay on sports programming were double or even triple that, it would still be a pretty small fraction of a typical triple-digit monthly cable bill. And the money flowing from the cable companies alone into the sports economy would be truly huge: Forty-five million subscribers paying $18 per month apiece works out at $10 billion a year. The fact is that if it weren’t for live sports, the number of cable TV subscribers would be much lower than it is right now. Ten billion dollars per year is undoubtedly a lot of money, but the cable TV companies will ultimately pay that much and more — and not only because many of them are also owners of sports franchises. For the cable companies, even if they pass on all the costs, live sports are not a way to lose subscribers—they’re a way to retain subscribers. Indeed, that’s why the cost of live sports programming is going up around the world: It’s the easiest and most effective way for TV channels to get the ratings they live for, and they will bid each other up to stratospheric levels to secure those rights. In an age of continuous distraction, live sports are the one thing that will glue a nation to a single channel for hours. So if the TV channels are paying ever-greater sums for sports programming, and the cable companies are paying ever-greater sums for sports channels, and consumers are paying ever-greater sums to watch their teams — then where does this all end? When does the price spiral become a bubble, and when does the bubble burst? The short answer is: Not for a while yet. The longer answer: It will happen if—and only if—the cable companies see more profit in being pure broadband providers than they do in selling TV. That might happen at some point, but no one has a clue when. The outlook facing the cable TV companies is simple: The number of TV subscribers is falling and is already lower than the number of broadband subscribers. Providing broadband is a relatively simple, high-margin business; providing TV is much more expensive and complicated. So why not get out of the TV business altogether and instead just charge for a dumb pipe into subscribers’ homes? If those subscribers want TV, they can buy their TV online, somehow. In order for this strategy to makes sense, however, both the lines in the Wall Street Journal chart need to keep on moving in their current direction. The number of TV subscribers needs to keep on falling — and there’s little doubt that’s exactly what’s going to happen. But also, the number of broadband subscribers needs to keep on rising. And that’s less certain. Broadband penetration is already high in the U.S., even though broadband is much more expensive than it should be. In order for the rate of broadband adoption to increase much further, the cable companies might well have to reduce prices. If that’s the case, they’re not going to stop providing TV service—after all, no one wants to be in a utility business with steadily declining prices. What’s more, as America moves from desktop to mobile and the home computer gets increasingly replaced by the smartphone, we could start seeing the second generation of cord-cutters—not the people who replace TV service with broadband Internet, but rather the people who replace broadband Internet with a good-enough LTE connection on their phones. If homes do indeed become increasingly reliant on broadband, and if the TV subscriber base continues to shrink, then at some point it will make sense for the cable companies to get out of the TV business altogether. Indeed, the latest NBA deal includes extra digital-only rights, which allow ESPN to put together digital packages for nonsubscribers. Expect more of those in the future , but at some point, such deals will start offsetting declining revenues from TV rights—sharply declining, assuming that the cable companies stop being TV companies and stop paying billions of dollars for sports programming (or any TV programming at all). If and when the cable companies get out of TV, it will cause a huge upheaval in the economics of sports, and probably many other industries as well. But for the time being, it’s still too early for any of the big cable companies to make the first move. Which, in turn, means that the megabucks era of professional sports will be here for a while yet.